Road Safety Essay competitions for School children during the road safety week @ http://morth.nic.in. Essay competitions on Road Safety; Proceedings. Rc.no.98 Dt. 18-01-2017; SCERT Telangana, Transport department -Essay Competition on the topic road safety during the road safety week (17-1-2017 to 23-1-2017) and to upload their best entry at MORTH website-reg. 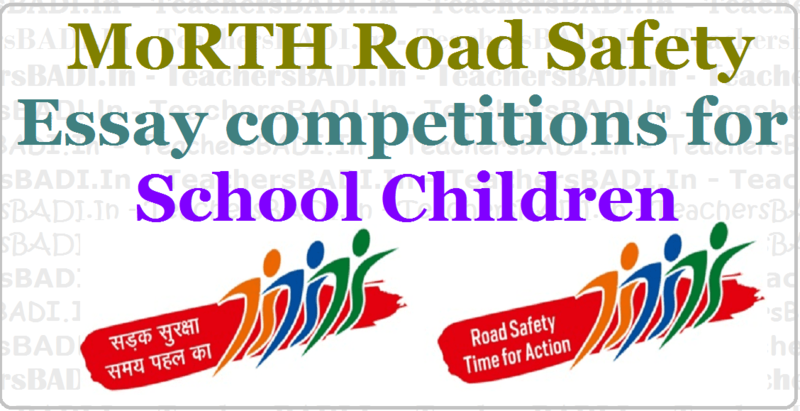 The attention of all the DEO in Telangana state are invited to the ref read above and they are informed that the ministry of road Transport High ways Department has proposed to conduct an Essay competition on the topic of road safety be organised amongst school children in the schools during the road safety week. The best essays will be given an award/certificate by the Ministry of road transport of the highways,Govt of India (MORTH). Organizing an essay competition among them and rewarding them will ensure that the issues related to road safety are thought over and discussed by them. This will also generate awareness amongst them. Along with the children such a competition is also expected to bring about awareness amongst the parents and teachers. Further it is informed that the top 10 entries selected by MORTH will be called for the award function at Delhi along with their parents and teachers. Therefore all the DEO in Telangana State are requested to take necessary action in conducting the essay contest during the road safety week in the schools and to upload their best entry at MORTH website: MORTH.nic.in latest by 31st January 2017. 6. Entries : Each School will upload its best entry on the MoRTH website, morth.nic.in latest by 31.1.2017.
i. First Prize - Cash prize Rs. 20,000/- and citation. ii. Second Prize - Rs. 15,000/- and citation. iii. Third Prize - Rs. 10,000/- and citation. iv. Remaining seven prizes of Rs. 5000/- each. v. The Consolation awardees will be given Rs.2000/ each. vi. All the awardees will be given a Citation. 8. Travelling/Lodging : Each of the ten award winners, their parents and school representative, will be reimbursed 2nd Class AC fare/ actual fare, whichever is less, for attending the award function. Each winner will also be given Rs. 10000/ lumpsum for boarding and lodging in Delhi for the function. Thanks Dear Sir/madam For Advice mi a Best Compliment..